Artificial Intelligence in Behavioral and Mental Health Care summarizes recent advances in artificial intelligence as it applies to mental health clinical practice. Each chapter provides a technical description of the advance, review of application in clinical practice, and empirical data on clinical efficacy. In addition, each chapter includes a discussion of practical issues in clinical settings, ethical considerations, and limitations of use. The book encompasses AI based advances in decision-making, in assessment and treatment, in providing education to clients, robot assisted task completion, and the use of AI for research and data gathering. 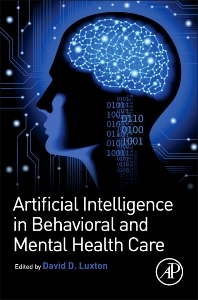 This book will be of use to mental health practitioners interested in learning about, or incorporating AI advances into their practice and for researchers interested in a comprehensive review of these advances in one source. Clinical practitioners, developers of AI technologies (AI scientists, programmers, engineers, etc.). Researchers in human-computer interaction. David D. Luxton, Ph.D., M.S. is a Research Health Scientist at the Naval Health Research Center in San Diego California and an Affiliate Associate Professor in the Department of Psychiatry and Behavioral Sciences at the University of Washington School of Medicine in Seattle. He previously served as a Research Psychologist and Program Manager for the US Army and as a Secure Communications Systems Technician in the United States Air Force. Dr. Luxton's research and writing is focused in the areas of military and veterans’ health, telehealth, mobile health, artificial intelligence, and emergent technology applications in healthcare. He serves on various national committees and workgroups and he provides training and consultation regarding the use and development of technology in healthcare. He is a licensed clinical psychologist in the State of Washington.